The Master of Arts in Teaching (MAT) in Business Education is designed for college graduates who have earned a bachelor’s degree in a business discipline and want to become licensed Business Teachers. Students completing this degree are licensed by the North Carolina Department of Public Instruction to teach business education courses in grades 7 to 12. The degree enables candidates to develop the knowledge, skills, and dispositions needed to become excellent instructors at both the secondary and post-secondary levels. In addition to pursuing careers in public education, graduates of the MAT in Business Education have the opportunity to seek positions in the workplace as business trainers. All Teacher Education programs are accredited by the National Council for Accreditation of Teacher Education (NCATE) and approved by the North Carolina Department of Public Instruction. As part of the School of Business and Economics, the undergraduate program in Business Education is accredited by AACSB International. The Master of Arts in Teaching in Business Education is accredited through the College of Education's affiliation with NCATE and TEAC, now known as CAEP. 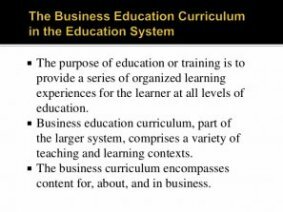 The MAT in Business Education is is divided into two phases. Upon completion of Phase I (27 credit hours), you are eligible to apply for your initial (A-level) teaching license. Phase II includes just four more courses (12 credit hours) and makes you eligible to apply for the M-level license.